In the media coverage leading up to the 2016 Rio Olympics, we mostly heard about the threat of Zika, the unfinished rail lines, the political unrest, and the frightening crime stats. But as the 2016 Games drew to a close and nothing catastrophic happened, we've still hardly heard anything about the friendly locals or the city’s vibrant energy — and that's a shame. When athletes arrived in Rio, they were both surprised at the lack of mosquitoes and reassured by the heavy security presence. All seemed to be going according to plan, and quite frankly, better than the world expected — there were few reports of infections from polluted water and no collapsed buildings following the supposedly dubious and delayed construction of Olympic venues. That is, until swimmer Ryan Lochte reported that he and three other American swimmers were robbed at gunpoint. This was a huge blow to, and a somewhat stereotypical confirmation of, Rio's reputation for crime. As officials began to investigate, however, they found holes in Lochte's story. His report began to unravel, and now he and swimmer Jimmy Feigen could be indicted for reporting a false crime. Just as the Olympics began to separate the host nation from its troubled image, Lochte seemed to take advantage of it to cover up his own apparent misbehavior. Needless to say, Brazilians were pissed. And as an American who once lived in Rio, I was also angry —but I wasn't surprised. Now that the 2016 Olympic Games have come and gone, I hope people will stop assuming that Brazil is only full of either problems or parties. If the Games showed the world anything, it's that Brazilians are up for a challenge. I moved to Rio as a teenager in 2007, and the narrative surrounding Brazil was the same. When my family announced our move, we were met with wide eyes and worried faces: Isn’t it super dangerous there? I’ve heard it’s not very clean. You’re moving to a third-world country? My mom was among the skeptics, since the move would be for my dad’s job. But when we took a short trip to Brazil before making our final decision, we were immediately captivated. Living in any metropolitan area takes common sense. Don’t venture to certain areas at night. Avoid taking the late bus alone. Leave your flashy jewelry at home. Be aware of your surroundings. Yet I’m well aware that I lived a privileged life in Rio. I lived in an upscale neighborhood and went to a private school. I socialized with Brazil’s upper class and went to the beach at Ipanema’s “Posto 9.” But I also passed through Rio’s largest favela every day to get to school. I took taxis by myself and stayed out far later than I should have. I often explored the city alone, and I became fluent in Portuguese. I fell in love with Brazil. Rio’s people (called “Cariocas”) are some of the warmest and friendliest you’ll ever meet — throw out a couple of Portuguese phrases, and they’ll be even more impressed. The food — from salgadinhos to feijoada — is incredible. (Not to mention that their go-to drunk food is sushi.) Turn one direction and you’ll see mountains; the other, ocean. Of course, Brazil is so much bigger than just Rio, and as much as I traveled nationally, I only scratched the surface. But what struck me the most about Brazilians, and what I will always carry with me, is their enthusiasm for life. People in Brazil appreciate the everyday beauty around them — whether it’s the sound of the waves or the love of a family member or their soccer team scoring a goal. Try and talk sh*t about Brazil and a local will likely defend it. And now that I've lived there, I will too. Now that the 2016 Olympic Games have come and gone, I hope others will stop assuming that Brazil is only full of either problems or wild parties. 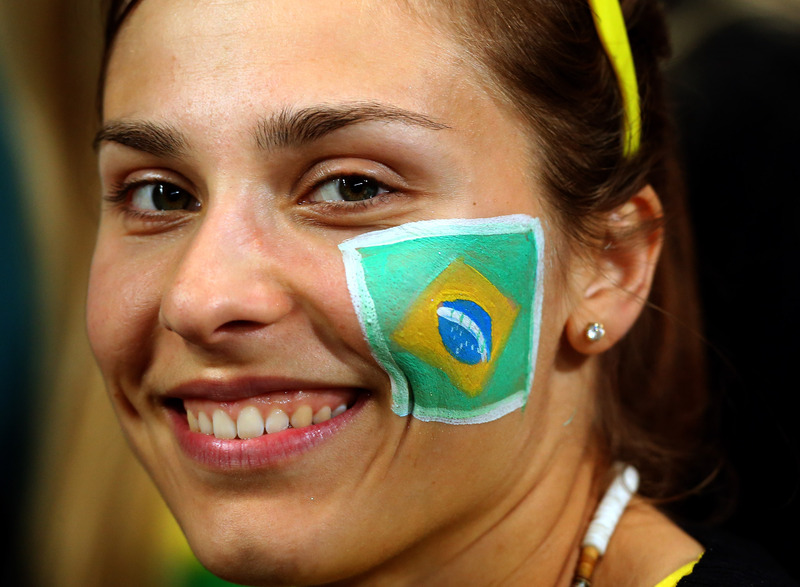 If the Games showed the world anything, it's that Brazilians are up for a challenge. Despite dramatic forecasting, they showed hospitality and grace in the face of adversity, and their joy was infectious — something I experienced firsthand during my time there. When Ryan Lochte fed into the common narrative about crime in Rio, he not only tainted the spirit of the games, but he insulted an entire city that, for two weeks, welcomed the world with open arms. The media fear-mongering leading up to the 2016 Olympics proved to be just that. What we really should have been doing is giving this beautiful, complicated city a chance. I, for one, am certainly glad I did.